Can be easily shaped or molded to form before setting. 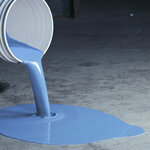 Ideal for repairing light to medium concrete damage. Tigercrete™ is prepared and ready to use after adding water. Due to its fast-setting characteristics, Tigercrete™ saves time, labor and site tie-up. Tigercrete™ has thousands of uses. Repair broken, blistered or disintegrated concrete, brick or masonry. Excellent for vertical surface repairs because no formwork is required. Easily "mold" or shape repairs with a trowel. Tigercrete's high strength is 2x stronger than regular concrete. Tigercrete™ has been specified for use by federal, state, county and municipal governments, as well as port authorities, military installations, public and private utilities, railroads, airlines and major manufacturers. 40 sq ft. at 1/8" per 5 gallons. Initial Set: 15 - 20 minutes. Final Set: 35 - 40 minutes. Single component 5 gal pail for easy application; Components Include: 50 lbs powder. Tigercrete™ is approved for shipping to all 50 states by ground or air.